When you have connected your Jackrabbit database to your QuickBooks account and have assigned a QuickBooks account to each of your Jackrabbit Category 1s, you are ready to export your revenue! From the Tools menu > QuickBooks Export select QuickBooks Online Export from the left menu.Use the criteria here to choose which transactions you want to export. Select which Jackrabbit Location(s) you would like to include in the revenue numbers being exported. Enter the date range you wish to export. Indicate whether or not to include any refunds you may have done during that time frame. When the export has completed you will be taken to the QuickBooks Online Export Results page which displays the status of the export and includes details about the journal entry that was created in your QuickBooks account. A green Success status indicates that your transactions were successfully exported into your QuickBooks Online account. 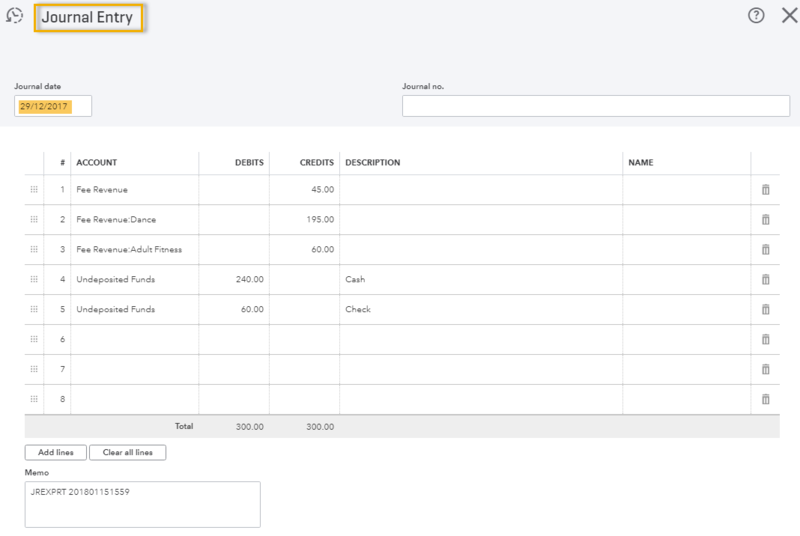 The journal entry posted in QuickBooks will include Debits and Credits that both add to the same total (in bookkeeping debits must equal credits in a journal entry). The debits in the journal entry are the payments you received from your customers broken down by payment method. They are posted to Undeposited Funds in your QuickBooks Chart of Accounts. The credits in the journal entry are the different Category 1s those payments were linked to. They are posted to the QuickBooks Revenue accounts you have assigned to them (Tools > QuickBooks Export > Assign/Edit QuickBooks Accounts). The information displayed in the export results will agree to the Revenue Snapshot report run for the same date range. 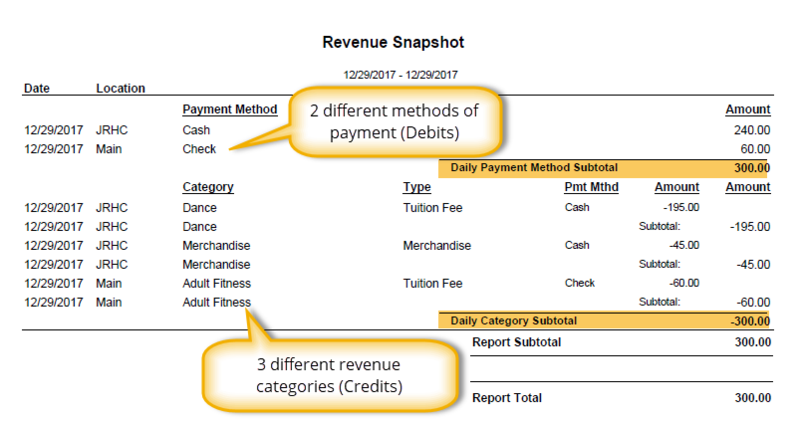 The Revenue Snapshot report can be considered the 'backup' for the journal entry. There is a link to this report in the QuickBooks Online Export menu. It can also be accessed from Tools > Reports. At this point you should confirm the journal entry came into QuickBooks correctly. 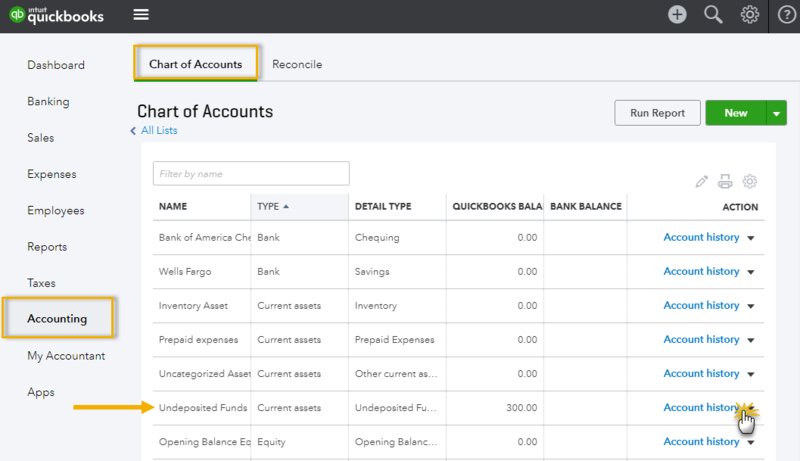 Sign into your QuickBooks account and navigate to the Chart of Accounts. Locate the Undeposited Funds account and click on Account History to see the account ledger. From the Asset Account History ledger click Journal on one of the entry lines and then click Edit to view the journal entry. 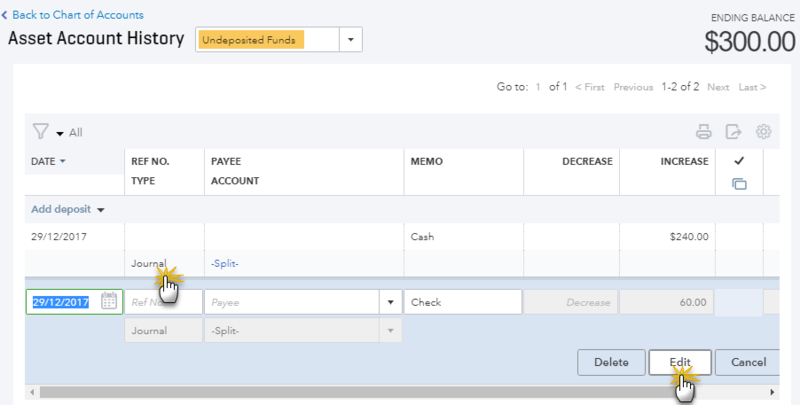 To learn about moving the amounts from the Undeposited Funds account into a bank account in your Chart of Accounts review our Help article Undeposited Funds & The QuickBooks Bank Deposit.